With a hand lens or a microscope and a little bit of practice, it is possible to learn to identify Drosophila suzukii (SWD) adults from other small Drosophila species that will likely be collected in the same monitoring traps. We have made this identification card to highlight the main identifying features of adult SWD. We have also included a link to a dichotomous key written by Josh Vlach at the Oregon Department of Agriculture, which may also be very useful in identifying SWD from other species. Adult SWD are 2-3 mm long, and are light yellow or brown in colouration, with red eyes. Both males and females have dark bands that are unbroken across their abdominal segments, and the final segments can be more darkly-coloured (Fig. 1). Male SWD have a distinction black dot on the leading edge and first vein of each of their wings (Fig. 2). It is important to note that the spots can take 1-2 days to fully develop on adult males. 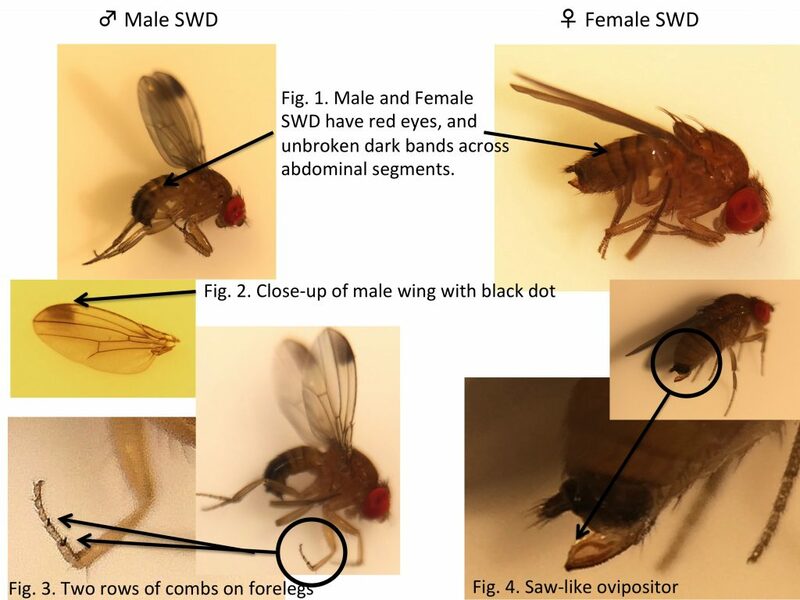 Male SWD also have two dark rows of combs on the tarsi of each of the forelegs (Fig. 3). Other species may have only one row, or they may be absent. Female SWD do not have the dots on their wings, but they are identifiable by their long, serrated ovipositor (Fig. 4). It is saw-like in appearance, and has two rows of teeth that are darkly coloured compared with the rest of the ovipositor.